Welcome to the Weddingburgh Fringe! Comedian Bec Hill got married at the Edinburgh Fringe today – and recruited plenty of comedy folk to help her. 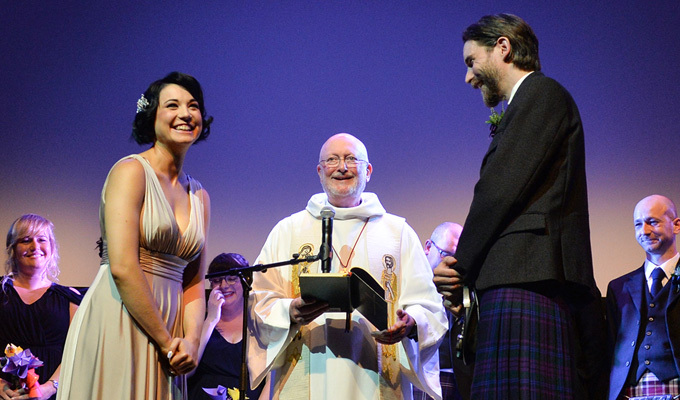 She tied the knot with Gavin Innes, who proposed during her show at the Gilded Balloon three years ago. He popped the question as the London-based Australian engaged in some banter with the audience, asking them what they would do if they were mugged. Innes put his hand up from the back of the room and said: 'I'd propose.' He then came on stage and asked to marry her. The pair returned to the venue for their wedding this afternoon, officiated by Rev Christopher Hardy, the vicar father of Tom Crowley, from sketch trio Sad Faces. Invitations had been sent out on Gilded Balloon tickets, and the confetti made from ticket stubs. Jonny And The Baptists and Steve Pretty played as Hill walked down the aisle, and entertainment came from comics Steve McNeill, who renamed his show WiFi Wars as Wifey Wars for the occasion; Phil Nichol, who co-hosted the ceilidh; and Felicity Ward and Axis Of Awesome musician Benny Davis, who DJed. Steve Ullathorne, a photographer who specialises in comedians' portraits, recorded the occasion, including the photographs on this page. Hill and Innes met in 2008 when he was working front of house for her show at Melbourne Comedy Festival. He has since gone on to become supervisor, stage manager, and director for her shows.